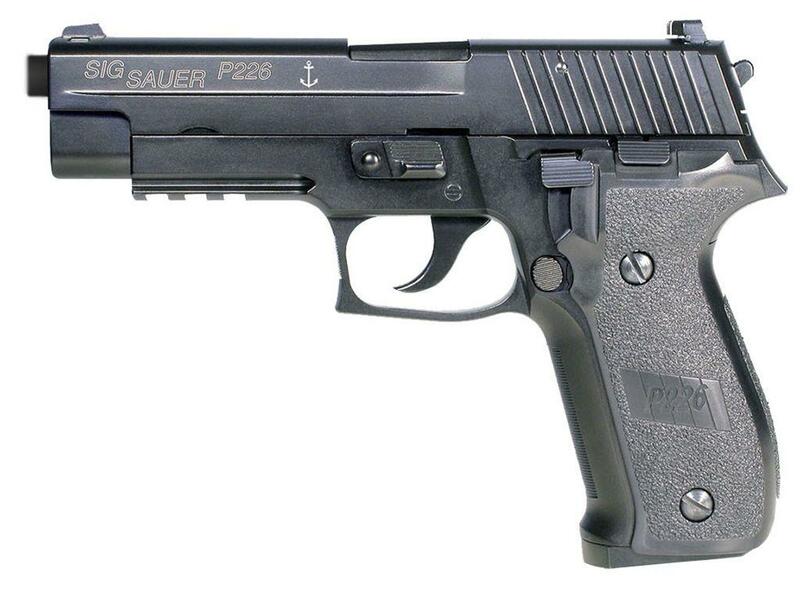 Sig Sauer P226 Navy Airsoft Pistol |ReplicaAiguns.ca | Easter Weekend Sale! Comments: Are you ready to take aim with a pistol that is trusted by military units worldwide? This replica Sig Sauer P226 Navy Airsoft Pistol has a powerful blowback system with a metal design that is nearly identical to the real steel version. Fixed front and rear sights and the BAXS hop-up system will ensure that you achieve pinpoint accuracy. http://www.ReplicaAirguns.com - Cybergun Sig Sauer P226 GBB Blowback Airsoft Pistol Table Top Review. This is my official Table Top video review for the Cybergun Sig Sauer P226 GBB (Blowback) Airsoft Pistol, I show you around this very well executed replica and talk about some of the Pros and Cons along with its main specifications and features, I also do a quick field strip and talk a bit about the barrel mod to remove the orange metal tip. I am a big Sig Sauer fan so it would take a lot for me to not give this gun a good review, with that said it performed pretty well, sure it was not the most powerful but I was using gas over CO2 so I was not expecting too much, it also shot a bit low for me but again that may have been because of the barrel mod so who really knows for sure at this point ;) And yes it came with that unsightly orange tip that I took short work of removing. At teh end of the day I still love it and it performed well without letting me down, just like a would expect from a real Sig Sauer!